The Vasquez family grows luscious berries using sustainable techniques on 15 acres in Moss Landing. *Ester and Rudy Vasquez, owners of Vasquez Farm, are a couple as sweet as the berries they grow in Moss Landing. They sit together comfortably on the couch in their home telling stories punctuated with Rudy’s playful jokes. The couple is celebrating 50 years of marriage this year. Both Ester and Rudy both grew up in farming families on the Central Coast of California. Ester’s grandparents and parents were migrant farm workers from Jalisco, Mexico who settled in Castroville. They then moved to Moss Landing where they worked as sharecroppers on one of the first strawberry farms in the area. They ultimately purchased five acres of their own in 1944 on Jensen Road in Moss Landing and starting growing strawberries in the 1950s. Farming was a family affair involving Ester and her siblings, cousins and friends. Ester has fond memories of walking with her grandfather to irrigate the fields at 7 am before school. Rudy’s parents came to work on a large farm in Santa Clara, California from San Luis Potosi, Mexico in 1948 as part of the Bracero program. Between the years of 1942 and 1964, millions of Mexicans were allowed to take temporary work in the US. The program was established through an agreement between the US and Mexico for the purpose of meeting US food supply needs during World War II. The program initially imported workers for agriculture and later for the railroads. When mutual friends introduced them in 1957, Ester and Rudy realized that their paths literally crossed almost every day. Ester was working on her parents’ farm and Rudy was driving a truck for Watkins, a packer/shipper located near by. After they married, Ester continued working on her parents' farm until 1973, when the couple purchased 15 acres of land in Moss Landing. Ester began reclaiming the berry fields and grew several types of berries with the help of a few employees. Rudy, however, was not enamored with farming after seeing how hard his father worked. Instead he worked in a variety of jobs over the years: he worked as a foreman at a large chicken ranch for 20 years, at a cannery for a few years, and then at a squid company for 10 years. It wasn’t until 1993 that Ester convinced Rudy to work on the farm. 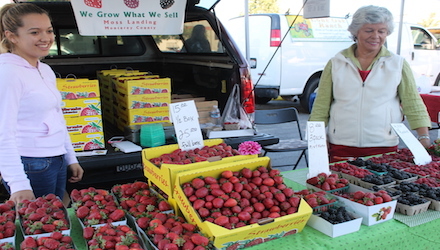 By that time, Ester was running a successful business growing strawberries, raspberries and blueberries and selling them at several farmers markets including the Monterey Bay Certified Farmers Markets at Cabrillo College, Salinas and Monterey. She also worked as a bilingual aide in a local school. Rudy found a role on the farm he enjoys — driving the tractor and selling their berries at farmers markets. He now participates at eight different markets. The Vasquezes are in the process of having their farm certified organic by CCOF. Ester and Rudy have a lot to be thankful for. They are proud of their six children who helped out on the farm during their school years, and are now employed and living on their own. Six of their 16 beautiful grandchildren help out at the farmers markets. Ester and Rudy find participating at farmers markets very rewarding. “It’s like being part of a big, warm family,” says Ester.